one of the survey parties despatched to survey the Wairau Plains on behalf of the New Zealand Company. Shortly after beginning operations, all the survey parties were turned off the land and their huts burnt to the ground, by order of the Maori Chief, Rauparaha. 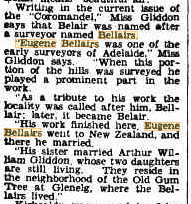 Mr. Bellairs subsequently joined the ill-fated expedition, sent by the Government to apprehend the chiefs who were responsible for this act. The result is well-known, for about twenty Europeans, including most of the leading men of Nelson, were creuelly and treacherously massacred, after their surrender to Rauparaha under promise of safety. Mr. Bellairs was one of the few who effected their escape. Following is a quotation from a local newspaper:-“Shortly afterwards he joined his cousin, Captain Bull, who, with a detachment of his regiment (H.M. 99th), was stationed on the Blue Mountains (New South Wales), in charge of a stockade where some 300 convicts were engaged in road-making. In 1846 Mr. Bellairs accompanied, as a cadet, the first overland expedition that ever attempted to reach South Australia by the Darling River. This party was organised by a Mr. Ray, with a view of taking to Adelaide a mob of cattle and horses. The trip took ten months to accomplish. At the time, they were considered to have been very fortunate in getting through, as the blacks were known to be the very worst they could have encountered, and more especially as the expedition numbered only sixteen all told. Shortly after his arrival in Adelaide, Mr. Bellairs received an appointment on the survey staff, under Captain Frome, R.E., and at the end of the ‘forties’ surveyed a road through the 120 mile scrub desert between the Murray River, near Lake Alexandra, and the Tatitara country. This subsequently, in 1850, became the highway to the Victorian Goldfields, effecting a saving of some seventy-five miles, as compared with the old Mount Gambier Road. Mr. Bellairs, after the action at the Eureka Stockade, took cypher despatches for the officer in charge of the Ballarat military encampment—a Major Thomas—to General Macarthur, whom he found encamped at Ballan, on his way with reinforcements to support that officer. About 1862 Mr. Bellairs returned to New Zealand, and was engaged by the Government in making surveys under the late Major Heaphy, during active operations in the Waikato.” Mr. Bellairs was married in Tasmania in 1855 to the second daughter of Mr. H. Priaulx, Assistant Commissary General of that colony.